That who which 1. everything, anything, nothing,any, little, one,few,much,all,none a.There isnt much that I can do. b. He told us everything that he had. 1 that who which 1. everything, anything, nothing,any, little, one,few,much,all,none a.There isnt much that I can do. b. He told us everything that he had seen in the traffic accident. 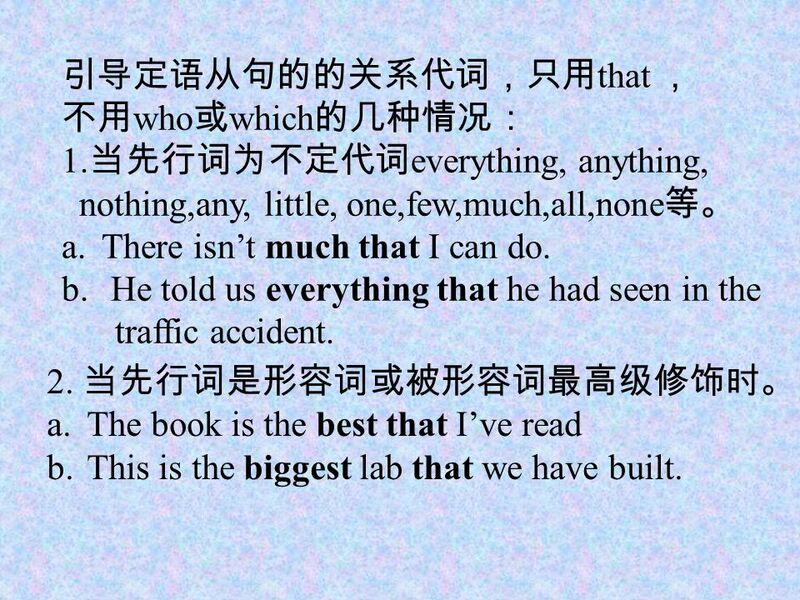 2. a.The book is the best that Ive read b.This is the biggest lab that we have built. 2 3. a.It is the third one that I have bought. b.This is the first place that I have visited. 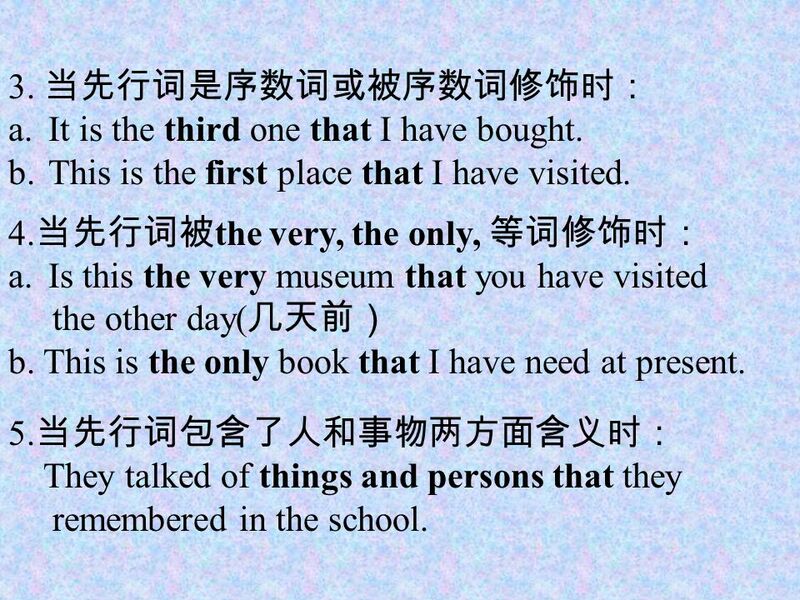 4. the very, the only, a.Is this the very museum that you have visited the other day( b. This is the only book that I have need at present. 5. They talked of things and persons that they remembered in the school. 3 6. who,which who a.Which is the book that he bought yesterday? b.Who the you have ever seen can beat him in the game. * 7. a.This is no longer the place that it used to be. 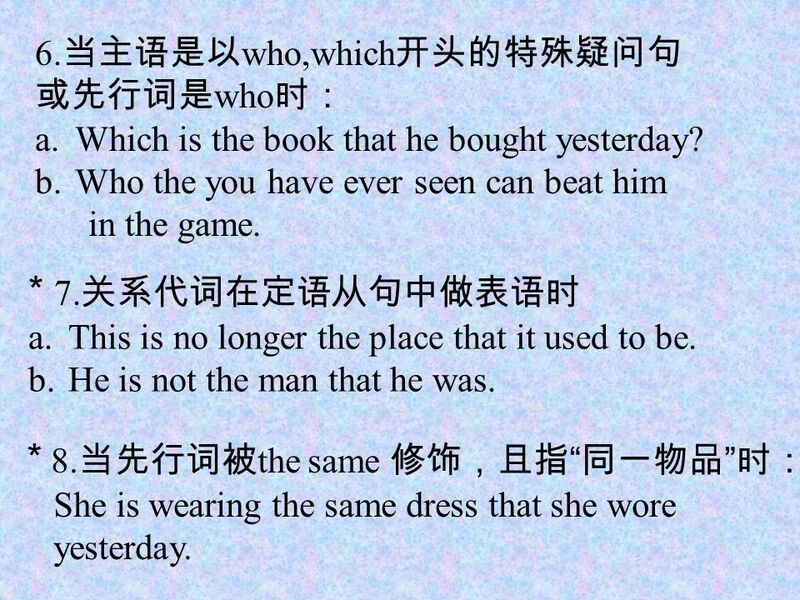 b.He is not the man that he was. * 8. the same She is wearing the same dress that she wore yesterday. 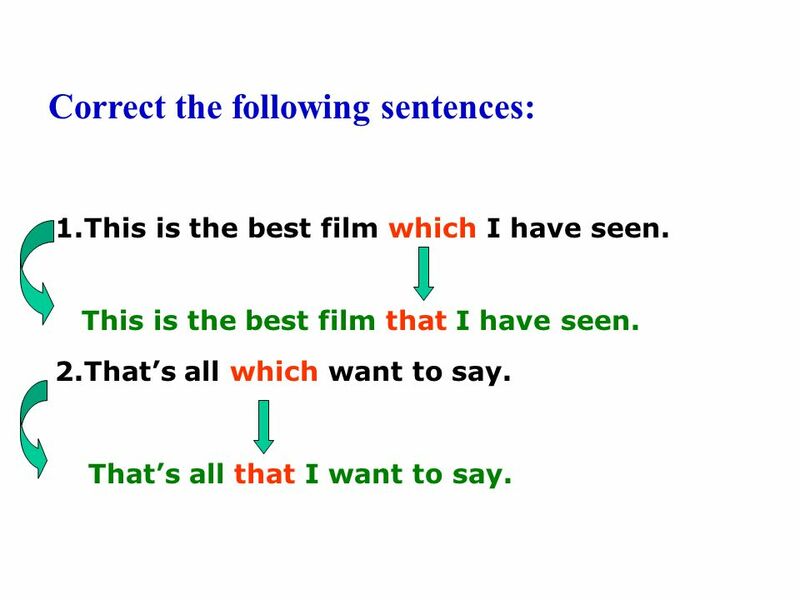 6 Correct the following sentences: 1.This is the best film which I have seen. 2.Thats all which want to say. This is the best film that I have seen. Thats all that I want to say. 8 3.Is there anything which you want in this shop? 4.He talked about some writers and books which/who were unknown to us all. 5.The room in that she lives is a large one. Is there anything that you want in this shop? He talked about some writers and books that were unknown to us all. The room in which she lives is a large one. 9 3.Is there anything which you want in this shop? 4.He talked about some writers and books which/who were unknown to us all. 5.The room in that she lives is a large one. Is there anything that you want in this shop? He talked about some writers and books that were unknown to us all. The room in which she lives is a large one. 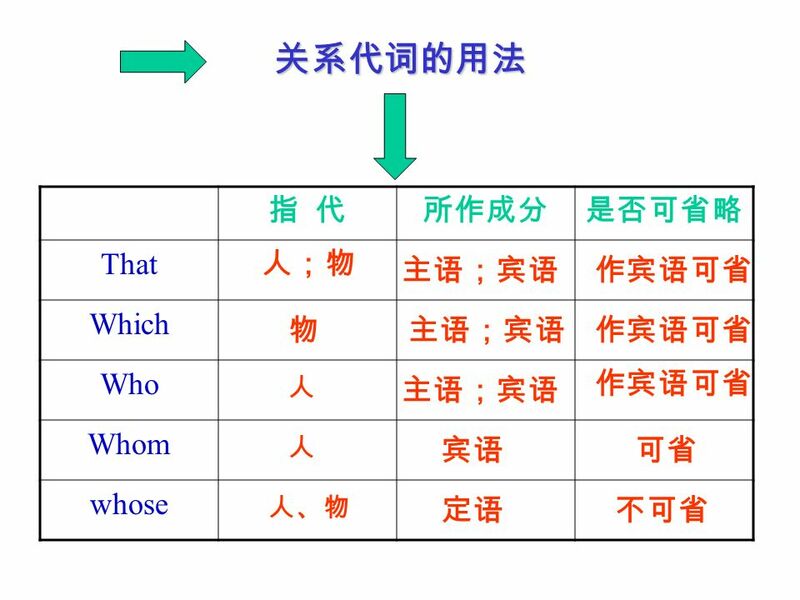 Download ppt "That who which 1. everything, anything, nothing,any, little, one,few,much,all,none a.There isnt much that I can do. b. He told us everything that he had." 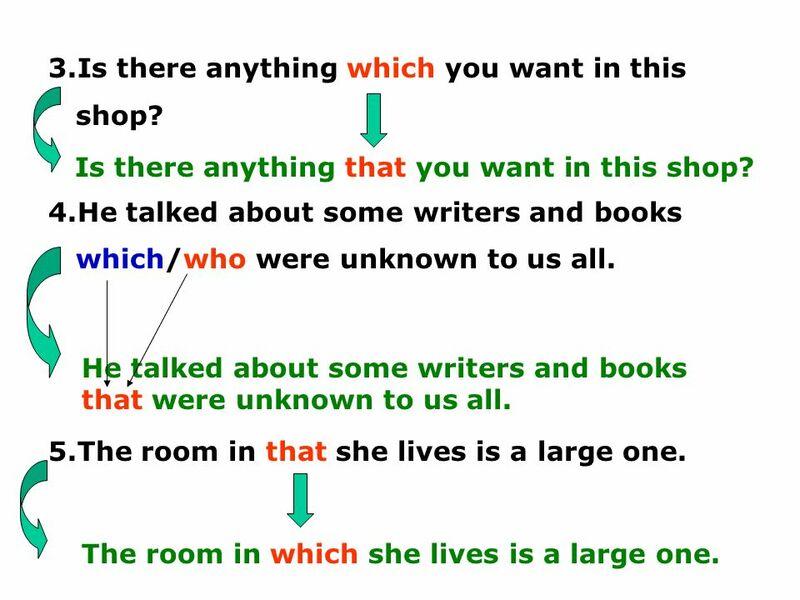 The Attribute Clause. the handsome the tall the strong the clever the naughty boy The boy is Tom. The boy who is handsome is Tom. The boy who is tall. 1. I still remember the day ________ I first came to school. on which 2. This is the reason ________ he was put in prison for which. 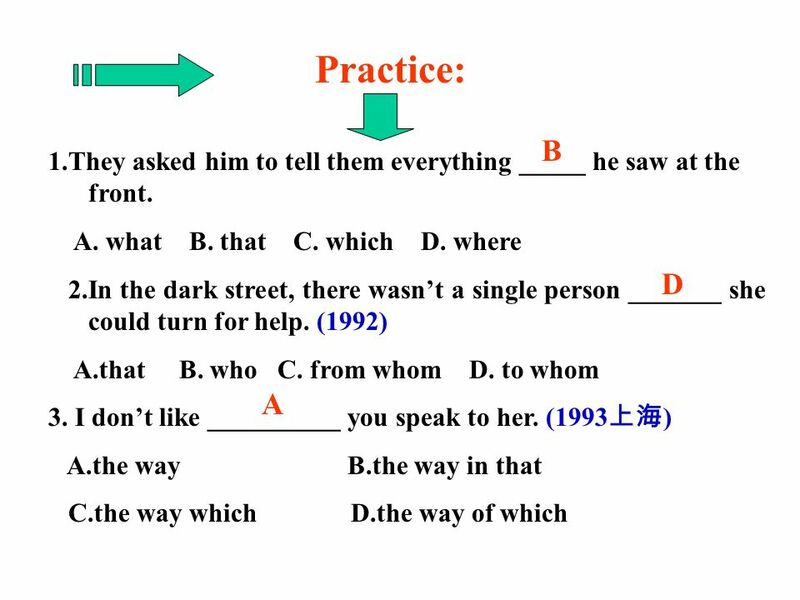 The Attributive Clause 定语从句 By logan. Who: She looked at Jeff who was waving his arms. That: The story that you read is “The Rescue”. She looked at Jeff. UNREAL CONDITIONALS. SECOND CONDITIONAL If would + subj + past simple, subj + vb- base form Unless could/might. Linguistic levels of structure Sound Phoneme Morpheme Word Phrase Clause Sentence Meaning ð iː z b juː t ə f ʊ l w ɪ m ɪ n s ɛ d w iː w ɜː t r uː m ɛ n.
Come and See. The Sceptic ‘We have found the one Moses wrote about in the Law, and about whom the prophets also wrote – Jesus of Nazareth, the son of. Duty Report What day? What date? Did you see this movie?